When we refer to engagement rings, we usually talk about a women's ring with a raised diamond that signifies her upcoming marriage. However, engagement rings for men are becoming increasingly more popular with straight and gay men and both men and women can show the world that they are engaged. What are Men's Engagement Rings? While it is true that men are less likely to wear pretty gold engagement rings with a mounted diamond in the middle, men can benefit from a simpler band. 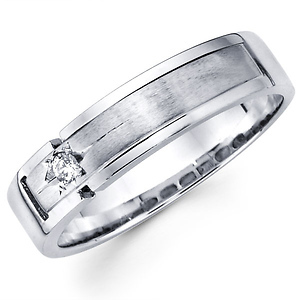 Most men will choose a simple ring that can be converted into the mens wedding band or that can be moved to another finger after the wedding ring is put on the finger. Other men may choose wide wedding bands with a bezel or channel set, solitaire diamond nestled on top, resembling women's engagement rings with a more masculine design, such as the image to the left. With a bezel set stone, the diamond sits on the same plain as the ring instead of raised above like a woman's ring. Some men, however, might like something with a bit more flare. These men can choose engagement rings that are two-tone or that have some texture and filigree to them. Some men like titanium male engagement rings because the metal offers a melange of colors in black, purple, blue, and others. Many times the woman will have a simple engagement ring engraved with a special message, date or other symbolic thing to both signify the ring's importance and to ensure that it has lasting value. Mangagement rings can be chosen by both people in a couple, the wearer himself, or the person proposing. When shopping for a man's engagement ring, it is important to consider his particular taste and preferences. If he is active, he might prefer a low maintenance tungsten ring that also sits low on the finger. He might also prefer a slightly less expensive metal so there are no worries about its safety. The concept of men's engagement rings might be new to many people as gender stereotypes fade and gay marriages becoming legal in more and more states. With this new trend, just remember the basics when choosing a ring. Consider the person's fashion style, if it will be used as the men's wedding ring or an accompaniment to the wedding band, and budget.